Ever since I saw the first commercial for it, I knew I had to have to perfect tortilla pans. I am constantly eating soft tortillas, but one thing I always miss when I eat them is a crunch. Well, we had been waiting and waiting for these to come into stores, and we had been hoping they would come into stores before me and Aaron had left to go on vacation, to see his parents. Well, they hadn't of course.. Lol. When we were up visiting his parents though, we made a trip to Walmart, and that's when I saw them. There they were.. The beautiful tortilla bowls that I had been wanting for so long. As soon as I saw them, I didn't even think about it; I grabbed them. I was so happy, I called my mom and grandma right there from inside the Walmart. As soon as I called my mom, and she picked up, I was like "Guess what?!" she said "No, you guess what!" and so I just busted out and told here we were at the Walmart and I had found them, and I kid you not, my mom told me that she was at the Walmart right at that moment, and she had the pans in her hand too! Turns out she was just about to call me as well, LOL! We ended up not getting them during out visit, and decided to just wait until we got home, since my mom was already getting some. Well, our first night back we made the tortilla bowls, and had tacos for dinner :)! I loved them! The first set we burnt, but it was our fault for leaving them in for 2 extra minutes. The second set was just perfect, and were everything I had wanted. I LOVE taco bowls, and I can't wait to use these more! I'm so passionate about the product, that I decided to go out and get a extra one today, to give to one of you as well, so you can try it out :). 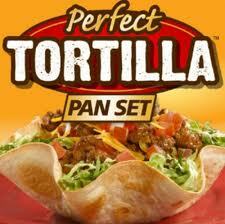 1 of you will receive a set of the Perfect Tortilla pans! Open to worldwide entries. Disclosure: I received nothing in exchange for this post. The product reviewed and being given away was purchased by me. All opinions expressed are my own, and were not influenced in any way. Giveaway ends 9/24, and is open to Worldwide entries. My entire family has been wanting to try these for some time now. I have not tried them but would like to...I do love taco salads so these would be great. Actually, I've never heard of them, but they can be very handy when we prepare lunches with my boyfriend together. This seems to be very good!!! I have never tried this before, but i want to!! I've wanted to try doing this for a while. We'd love to make our own salads with this. I've been waiting for something like this since Aztec came out with their Taco Salad kit years ago. They have those cardboard fold up forms to make the bowls and are not reusable. I have been wanting to try these for awhile. I would love to win them. Thanks for the giveaway and opportunity to win. Yes, I have been wanting to try them since I saw the commericial. I wondered if they worked well. I'm gonna search now if this thing exists here, in any local shop, but it would be like amazing to win this. I've been wanting to try these. Thanks for the chance. My son would love having a meal out of a homemade bowl. I've been wanting to try them, but only recently heard of them! I love tortillas but I've never eard this one before. Well that's because I'm from Portugal blaaah Thank you for this giveaway and damn you Walmart, why don't you come to Portugal? I've seen them on television and have been wanting to try them since we make our own tortillas. I have never heard of them, but think they are so cool! I've never heard of them, but they are brilliant. I have been wanting these. I love taco salads and don't like eating fried shells. These sound good. I have heard of them although I never have tried them and would really like too! I saw these advertised somewhere(can't remember where). I would love to try these! Looks like they would make the perfect tortilla bowl. I have never tried them, to be honest I do not think I ever saw them here. These sound great...I've never heard of them before. They look like fun to work with. Ive never heard of them before but they look awesome, would love to win some thanks for the chance! i've been wanting to buy these!!! I have never heard of them before today, but I would love to try them! I've seen them on tv and I can't wait to try them. I have never heard of them before today but it would be great for our mexican nights! I have never heard of them before but they would be great for Mexican night! 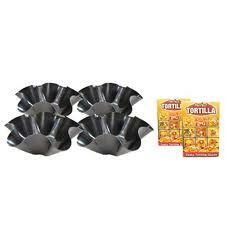 I had never heard of tortilla pans before. I'm thinking that a layered dip would work in one and when you get get near the bottom you can dip pieces of the bowl! Never heard of it before today but definitely want to try it out now! i've seen the tv ads for these for weeks and i've been dying to have them! I have seen the commercial for them once and I've been dying to try it. This would be so fun for the kids! I have never heard of this before but I now want it! hubby is Guatemalan and I would love to try these out! Haven't tred them yet but want too. I've never heard of this product, but it looks great and practical. I HAVE SEEN THESE AND I KNOW I WOULD LOVE THEM. I LOVE MEXICAN AND ALSO I CAN FILL THOSE BOWLS WITH A LOT OF STUFF. IF YOU MAKE THEM IN THE OVEN THEY ARE BETTER FOR YOU!!!! i have wanted to try these for a long time...keeping my fingers crossed i win!! i've actually never seen these before today. a couple of years ago, i found something on amazon that you use to deep fry tortillas into crispy shells...they're wonderful but of course packed with fat and extra calories. i'd love to try this! ive heard of these, wanted to try them, but never saw them in person! id love to win these! thanks! I have never even heard of these, but now I want some. They look super easy to make tortilla bowls! Like your story about your mom and you shopping. Have not seen any up in Canada as yet. Would like to try one at home to surprise my family. I have heard of them and have been wanting to try them. I would like to try these! We actually purchased some but as a gift for someone else. I've been wanting to try these! I'm a HUGE Mexican food lover and I'd love to try these with my family. I've heard of Perfect Tortilla and would like to try these.